Injuries are the most feared word in the language of the athlete and the coach. Statistically, it has been proven that almost all athletes, professional or amateur, will experience an injury at some point in their athletic careers. Many of these injuries could be prevented (or, at least, reduced in severity) by taking precautionary measures and listening to the body’s warning signals. With running, most injuries begin at the ground level. More precisely, they begin with the foot’s impact to the ground. One misstep, taken at a high speed, equals a “traumatic injury to the foot and lower extremity.” Small irregularities in gait, multiplied by thousands of foot strikes, result in predisposition to stress injuries along the foot/leg musculoskeletal chain. Athletes who experience injury to the lower extremity may do so due to many factors. A few of these include errors in training and improper conditioning. Training errors generally concern one or more of the following: unsuitable running technique, increasing speed and distance too rapidly, use of the wrong type of shoe, too little rest, poor running surfaces, sand terrain poorly suited to the ability of the runner. Good running technique is essential to the prevention of injury. It is best to run in a relaxed position, with the trunk erect and the hands held loosely. In addition, shorter strides are preferable to long ones, especially when running on hills. Shorter strides place less stress and strain on the entire lower extremity, and do not necessarily have to compromise running speed. Increasing speed and distance should be done gradually, so as to allow the body to physiologically adjust to the increased stress and demand placed upon it. Generally, it is wise not to increase one’s distance more than 10% per week. Train only in training shoes. 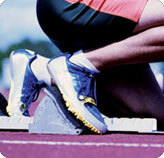 Training shoes are designed specifically for the task of training, as racing shoes are designed for racing. These shoes are not at all interchangeable and should only be used for their respective purposes. Rest is also a consequential factor in preventing injury. Get a good night’s rest between training sessions, especially if you are a novice. The body needs enough rest so as to allow for strength restoration necessary to complete the next training session. With regard to running surfaces, cement is the poorest surface upon which to run, as it has no yield or give. As a result, the majority of injuries occur in those who run primarily on a concrete or cement surface. The best possible surfaces for running are dirt or synthetic tracks, where the impact to the foot is minimal. Grass surface is acceptable, except for those who have ankle instability, or are prone to sprained ankles. Asphalt, likewise, is not as good as a track surface, however, it is quite satisfactory, and is preferable to cement. The question of terrain – hills versus flats – is not quite as complicated as it seems. While both terrains are fine for the experienced, healthy runner, a novice or an injured runner should avoid hills. A greater amount of stress is generated in the lower extremity, especially the knees of the runner when he attempts to run hills. This can aggravate and accentuate an existing injury with subsequent catastrophic results. Proper conditioning is also a critical factor in preventing injury to the lower extremities. It is extremely important to maintain a good dynamic muscular balance of the lower extremity to minimize the risk of injury to the athlete. Typically, in runners, the muscle groups in the front of the leg and thigh are weak, while the muscle groups in the rear of the leg and thigh are very strong, tight and inflexible. 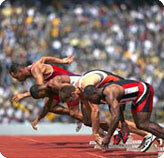 Therefore, there is a dynamic imbalance developing in the runner. Hence, it is exceedingly important to strengthen the muscles in the front of the lower extremity, quadriceps and other muscle groups, and stretch the posterior leg and thigh muscles. For specific stretching exercise, I recommend Bob Anderson’s book called “Stretching”, or Runner’s World issues on stretching. Strengthening exercises for the front of the leg and thigh can also be found in the issues of Runner’s World Magazine. A few words on stretching: Stretch, don’t strain, and above all, don’t bounce. Ease into the stretch, hold for 20-30 seconds without bouncing, then ease out of it. Bouncing will produce a contraction of the muscle and antagonize the desired intent.